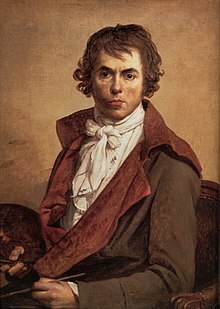 Jacques-Louis David (30 August 1748 – 29 December 1825) was both a politician and an artist who lived during the French Revolution. As a politician, he is most famous for being one of the handful of leaders that governed France during the most violent part of the French Revolution. David believed that France should not have a monarchy and instead it should be a Republic. He voted to have the King of France Louis XVI killed with the guillotine. When the French Revolution began to fail, David was happy that Napoleon Bonaparte became Emperor of France. As a painter, Jacques-Louis David wanted artwork to be political. He often painted heroes from myths or history that he believed represented good ideals such as strength, brotherhood, and virtue. His paintings are very realistic and often portray heroes from Ancient Greece and Rome. This is called the Neoclassical style of painting. One of David's most famous paintings is of his best friend Jean-Paul Marat who was killed during the French Revolution. David's painting helped make Marat into a popular martyred hero. This page was last changed on 6 September 2017, at 22:30.